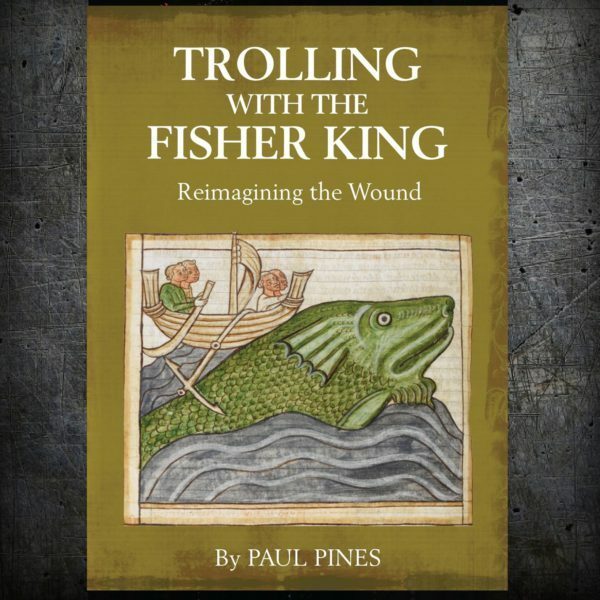 Paul Pines’s “Trolling with the Fisher King: Reimagining the Wound” is a work of staggering erudition and deep spiritual insights. This twilight memoir incorporates a lifetime of engagement with a wide variety of thought and deeds. Terrence’s words kept occurring to me as I read it: “I am human, and I think nothing that is human is alien to me.” Paul (I will use his first name since he is a friend as well as a writer under purview) weaves together many elements from sports fishing to quantum mechanics as if the performance by a master conductor. The legend of Parsifal, and particularly the version known as Parzival written by Wolfram von Eschenbach over 700 years ago, informs this book. The eponymous Fisher King is Anfortas, who was charged with the duty of preserving the Holy Grail. Known also as the wounded king for a wound in his groin that defied a cure, he became a symbol of the damaged psyche of a humanity taking many forms for Paul, including the post-traumatic stress of Vietnam, Iraq and Afghanistan war veterans. As just one example of Paul’s expansive reach, he starts with a meditation on this ancient tale and then connects it with the 1991 film “The Fisher King” starring Jeff Bridges as a radio shock jock who has become suicidally despondent after one of his on-air comments leads to a listener killing himself. One night, he is rescued from suicide himself by a homeless man played by Robin Williams who is on a deluded mission to discover the Holy Grail. The Holy Grail, sometimes conflated with the Holy Chalice that Christ drank from at the Last Supper, is supposed to provide happiness. As a psychotherapist (a day job for Paul that clearly reinforces his writing unlike Wallace Stevens working for an insurance company), this Arthurian tale is something that obviously resonates with Paul and that serves as a leitmotif throughout the memoir. Like the various knights who come to cure Anfortas of his incurable wound, Paul has spent a lifetime working, if not to provide happiness, to at least convert hysterical misery into ordinary unhappiness—as Freud once put it. Paul’s approach to psychotherapy is influenced by Carl Jung, whose theory of the collective unconscious meshes with Paul’s life-long fascination with the Parsifal tale. King Arthur’s court is a virtual treasure-chest of archetypal themes that can be the foundation for poems written in any age, from the 13th century to the twenty-first. Discussing some of his patients, he finds the fisher king a useful periscope into their subconscious. One patient named Perry complains about feeling empty. Nothing seems to last. Nothing of value. Since Perry is a real estate broker, one can certainly understand how such feelings can overcome him especially when he goes to a workshop led by a famous motivational speaker who asks the gathering how they would see themselves at the height of their success and what they would do with their money. In the age of Donald Trump, one can understand how any person in the field endowed with a soul would feel empty. Listening to Perry made Paul reflect “I hear Parzival suddenly aware that he exists in a Wasteland”. Hovering over the entire book is the presence of Charles Olson, the dean of Black Mountain College and the founder of the new poetry associated with the school, including Robert Creeley and Paul Blackburn. When I was a freshman at Bard in 1961, I became obsessed with their work and those of the other streams that converged in the mighty river known as the New American Poetry. In addition to the Black Mountain poets, there was the San Francisco Renaissance led by Lawrence Ferlinghetti and the Beats championed by Allen Ginsberg. All of them were collected in Donald Allen’s book of the same name that could be spotted on many bookshelves in Bard College dorm rooms next to Albert Camus’s “The Rebel” and James Frazier’s “The Golden Bough”. The connection to Olson is made through his landmark poem “The Kingfishers”, whose first two sections are included in the appendix to “Trolling the Fisher King”. The first line is referred to throughout the book, serving once again as a kind of leitmotif as in Wagner’s “Parsifal”: What does not change/is the will to change. Did Charles Olson have the psychotherapeutic search for happiness in mind when he wrote these words? We do know that he, like Paul, was influenced by Jung. After reading Jung and Carl Kerenyi’s “Essays on a Science of Mythology”, Olson became convinced that mythology could become a science and was not dissuaded by Robert Creeley describing the phrase “science of mythology” in a letter to Olson as “crap”. I suppose Olson is as important to Paul as Leon Trotsky was to me when I was developing intellectually as a young man. There certainly was enough of an affinity for Olson when I was young to have made him number one for me as well. When I went out to San Francisco in the summer of 1965, my intention was to be a poet not a revolutionary politician and programmer. It was best for me and the world that if noting else the war in Vietnam put an end to my literary aspirations (pretensions, really) since it would have taken me 10,000 years to become half the writer Paul Pines is. It is no exaggeration to say that if he is not the sole surviving practitioner of the New American Poetry, he certainly is the best. In my Fisher King dream I’m using my childhood rig. Not the earliest one, a stick with a line and a hook, but a small fiberglass rod and spool reel. In those days I dug up night crawlers for bait in a section of Prospect Park where the earth was always damp. I later learned to handle a spinning reel, set the drag and cast and drop lures attached to a float. It was the middle rig I used in my dream, the one on which I hooked crappies (small sunfish) in Prospect Park Lake at the end of Harry S. Truman’s second term. Just a few years after Paul was trolling Prospect Park, I was fishing alongside my father at Silver Lake in Woodridge, New York for what we called “sunnies”, another name for crappies, as well as bigger fish like the ferocious pickerel. I will never forget the day that my father took me to his secret worm-gathering cache, which was on the side of the road leaving Woodridge toward the Neversink River. He brought along a shovel and I toddled after him. Into a copse of trees, he began digging and quickly discovered pay dirt. He picked up a clump of very moist and very dark loam that was suffused with night-crawlers. He smiled and said, “We will fish with this”. For me, that was a Holy Grail of happiness that occurred only that once. It was too bad that his own Anfortas type psychic wounds suffered in the Battle of the Bulge prevented us from ever bonding like this again. “Trolling with the Fisher King” can be purchased online from Chiron Publications. Interesting post — one further detail on the movie: Jeff Bridges (shock jock) rants about yuppies taking over New York, and exhorts his listeners to get a gun and shoot them. One listener does just that, and happens to kill Robin Williams’s wife at a trendy NYC watering hole, which leads to Williams’s breakdown and slide into homelessness. They later meet, and form a remarkable bond. Powerful film. Mercedes Ruhl got “best actress” oscar for her performance.